It was fueled by higher revenues from software publishing and information service activities. This chart from Department of Statistics Singapore (SingStat) shows that information and communications services saw the highest revenue growth of 13.5% YoY in Q2 which was fueled by higher revenue registered by firms engaged in software publishing and information service activities such as data centre and web portal services. Other industries which also saw a rise in business receipts include financial & insurance Services (10.1%) and business services (7.9%). 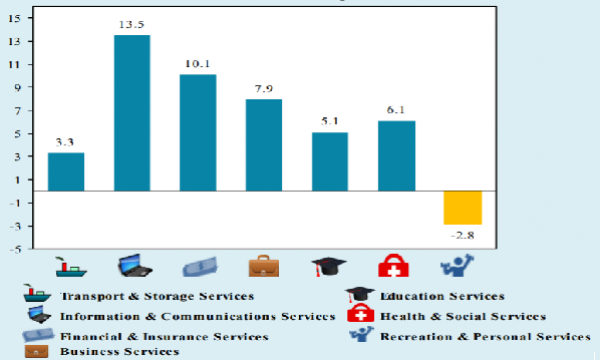 Meanwhile, the recreation & personal Services industry saw a 2.8% in revenues. Overall business receipts of the services industries not including wholesale & retail trade as well as accommodation & food Services advanced 7.8% YoY in Q2 2018. They grew 0.5% QoQ from Q1.